Photographs of original Closed Cab? How many 1927 Model T Ford Closed Cab pickup trucks were made? I see them, but have heard they do not exist. Do they exist? "I see them, but have heard they do not exist." I have seen them too and believe some went out the assembly plant door that way. The problem is that documentation for them doesn't exist (or at least hasn't yet been found), so it's a tough sell to "the establishment." Of the ones you have seen, what did they have for a cab? One for a TT? The 1927 Closed Cab Pickups that I have seen Were not made from the "C" Type Cab. They seemed to look like the 28 29 Model A Cab but most certainly we're not Model A. The Fenders, frame, radiator etc. are Model T.
Same here -- similar to early Model A's. I have seen two that appear they left the factory that way, but did not, by the admission of the guys that built them. Here's how it is done. The 26/27 coupe and tudor use the same doors as the 28/29 model A pickup. It is then possible to graft the rear of the A cab to the cowl from a T coupe or sedan using the doors that they share. Then it is a matter of blending the subframe and top rails together. Not a real problem for someone who has the equipment and know how. When done properly, it looks just like Ford built it. I have not seen any evidence of factory built closed cab T pickups. If there is any, I'd like to. Actually, now that I look closer, I believe Mike Black's closed cab pickup sits lower than Erick's TT cab pickup is because I think maybe Mike's cab is actually a "T" coupe and Erick's is a "TT". Hard to see Mike's very well in his very small profile photo. Com'on Mike,....show us a bigger photo of your pickup! I looked at Mikes photo. Bet it's a cut down 2 or 4 door. There would be a lot of body work to use a coupe body. Here a nice one. I'm not sure who's this is but I think it might be the one that is in a museum in Arkansas. My dad has an un-restored one that looks a lot like this one. I have heard stories about some of these being assembled at the Ford factory in late 1927. They were supposed to be a special order for the Bell Telephone company. However, I have not found any documentation to back that up. Too cold for me at home, so, I'm fishing in Okeechobee, FL. Click on my profile for a pic. Mine is a "bitsa" T. Its a 23-25 frame, motor, trans with 26 rear and model A "double down" trans machined and installed backward to provide overdrive. The bed is 26. The cab was made from a 25 coupe cowl, w/s, and doors. The door jams and rear part of a 26 tudor was fitted in place to make the closed cab. To fit in the right place to blend with the bed and fit with the cab the rear was channeled over the frame a little. That was a fun vehicle! Since the pic, I had it on a big trailer and ran it into a tree limb as I was parking, and wrecked it. Haven't fixed it yet--I have the cab and bed w/sills sitting on saw horses and turned the running gear into a depot hack! Too many projects! Ones I've seen look like the picture Rick G. posted, not like a TT cab. If it's true that some of these were made to fill a special order, the documentation for them may no longer exist. It is very frustrating to be looking for information which no longer exists. I spent a week at the Benson Research Center a while back, looking for information about Coupelets. Since the bodies were made by Fisher, not Ford, The usual drawings and other documents have been lost in the shuffle, if they existed at all. I suspect that most of the communication between Ford and Fisher at that time consisted of letters or telegraphs, and I was unable to find them. Archival information about the Fisher Body Co. no longer exists for the time before GM acquired Fisher, which was in the 1920's. A week at the Benson goes by pretty quickly. Gotta' go back one of these days. Looks like a cut down Tudor body. Wish someone had a picture of the rear 3/4 view of the body. Does the rear center panel curve under like the Tudor or go straight down? Why would Ford have gone to the trouble of building a pickup cab that was that different. They carried the box cab over for the Model A for pickups and trucks. A 28-29 Model A closed cab, is more of a T than it is an A. One item that I do not understand why they did it the way they did is the door latch post. On the 28-29 Model A closed cab it is made out of wood. The same part on the 26-27 Tudor and coupes is made of steel. They are made exactly the same shape, except one is wood the other is steel. 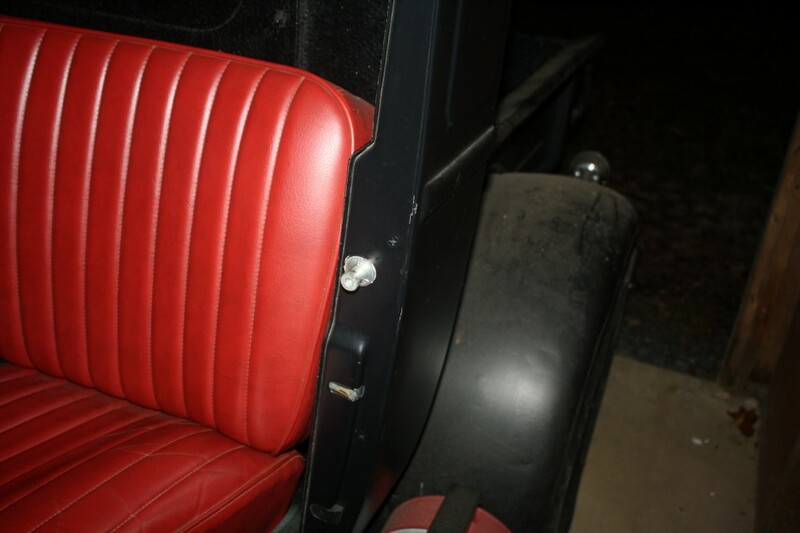 The only real difference (if much of a difference) is that the steel panel between the door and the bed is nailed to the door post on the Model A, and the nail strip is "rolled around a channel support on the 26-27 T door post, and then spot welded. Why did Henry have a wood piece made to put into a "steel" body, when he already had the steel piece in production that works. ??? I have replaced the wood Model A post with the steel Model T post several times. So I know for sure that they are a direct replacement for each other. The photo of the door post is from my 1929 Hot Rod Model A PK. (purist please cover your eyes) ... It has the steel model T post in it .. I am open to any new discoveries and would like to substantiate and document them as false, unknown, or factual. 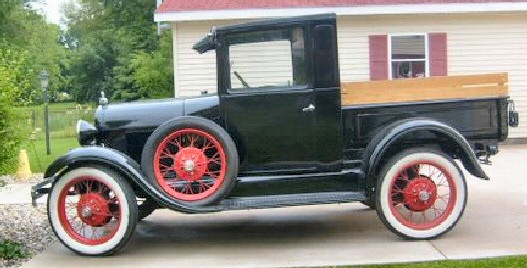 http://www.mtfca.com/discus/messages/331880/333725.html?1357665853 and is also included in Carl Pate�s book �Pate�s Early Ford Automobile Encyclopedia� available from the author at: http://www.earlyfordcars.info/ ] The listing after #1,119 through very early 1915 are available at the Benson Ford archives. Mike � there is a slim chance your Coupelet because they were all manufactured very early in the 1915 year might be listed. They are not in a nice order, they are hand written and sometimes very hard to read. They are in the Accounts Receivable Ledgers and are located in Accession 623, I believe in Boxes 1-8. ] But of other 78% or so cars we don�t have a nice document to say it was or was not built and sold. One of those cars is #220 that is not documented. But we have a fossil record because we still have an existing car. In this case in addition to an existing car, we have the story and photos of when that car was found. All of which point to it was in deed an early 1909 touring car that was part of Ford�s normal production. Some times the fossil record and documentation can be misleading. For example the shipping documents list car #3,300 as manufactured on May 19, 1909 as a Landaulet. That is solid original Ford Motor Company documentation that the car was produced. And when a Landaulet with that engine number was auction in Mar 2006 it was presented as a very rare restored original car. 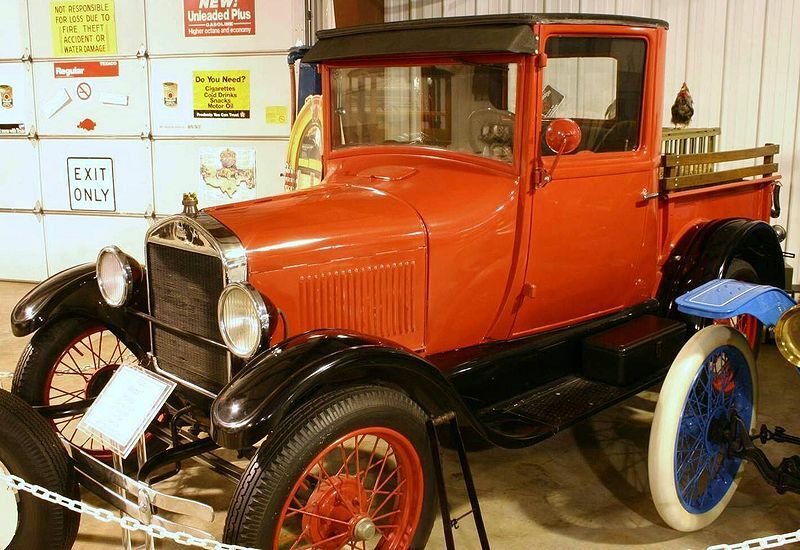 But later when the car was auctioned in Jul 2010 it initially had the same �very rare original� implied verbiage but an addendum was added to the description that read, �Please note the catalog description incorrectly describes this car as an authentic Model T Laundaulet. In fact, no surviving Model T Landaulets are known to survive. This particular car was constructed from reproduction and fabricated components �.. The body was a reproduction that was made by California-based Ray Wells before being purchased �.. and converted to the present Landaulet-style.� [See: http://new.rmauctions.com/lots/lot.cfm?SaleCode=MB10&CarID=r146&fc=0 for additional details.] So in addition to original Ford documentation and a fossil item, we need to verify that the fossil item was indeed produced by Ford as part of their normal production. Photo from page 13 of the Jul � Aug 1988 �Vintage Ford� used by permission. Did that Ton Truck exist � sure. Was it a normal production vehicle � almost certainly not. But if evidence surfaces later to show that Ford made a small production run � then we will need to update our information. And on page 62 of James K. Wagner�s �Ford Trucks Since 1905� he shows the same photo and an additional photo of a prototype panel truck on the Ton Truck chassis with an even more streamlined hood and cowl. And on the same page another prototype but this time a 2-Ton Truck based on the Fordson Tractor. So could Ford USA have built a closed cab prototype pickup truck � yes it is possible. Did they do a production run of them � again it appears highly unlikely. Why? I�m glad you asked. I�m 90 percent sure that the Ton Truck closed cab body will not just mount onto the car frame. The improved car hood will not line up well with the closed cab cowl. I believe the body brackets are in slightly different locations from the car brackets. I suspect that the longer steering column bracket on the TT closed dash would also need to be changed to a shorter one � but I don�t know that one for sure. .If someone can let us know on that � we would appreciate it. So �IF� Ford had produced a closed cab for the car chassis it would have a unique part number. And as far as I currently know, we don�t find any closed cab listed for the car chassis in any of the price list of parts books. And if it was a unique body � I believe it would have been listed along with those other low single digit production numbers discussed below. While we do not have records of what serial number cars were produced when and where in 1925-1927 we do have a very good listing of how many cars and trucks were assembled during the calendar year based on the assembly plant. See pages 469 to 473 of Bruce�s book. The listing also included truck bodies and pickup truck beds. And they were down to very specific numbers. I.e. in calendar year 1927 there were 28,143 pickup beds produced (not all of those would have necessarily been assembled onto a chassis � some were sold separately). For the open cab TT they were counting 1 produced at Atlanta and Cincinnati, 2 produced at Buffalo and Pittsburgh, 4 produced at Seattle, 7 at Chicago etc. They were counting very small numbers as well as the larger numbers such as Kearny which produced 1,923 closed cab TTs and zero open cabs. There is no listing for 1 or 4 etc. closed cab pickups. And yes, I know that the roadster pickups were included with the roadsters. But I think it would be a stretch to try to included the closed cab pickups under one of the other headings. So my current theory is that yes, we see several closed cab Model T Ford pickups. But none of them are a standard production vehicle by Ford USA. We would encourage anyone who thinks they know of such vehicle to please let us know. We could hopefully arrange to have someone check into it further. You will notice that so far in this thread all the �closed cab pickups� with a known documented history have been constructed by individuals and not by the Ford Motor Company. Should we stop looking � no. But I believe we can do a better job of documenting what is seen. We want to verify that it was, might have been, or clearly was not produced during normal USA Ford production. As a more modern example -- from http://www.ford-trucks.com/forums/1154391-lets-see-your-previous-ford-trucks.html below is a Pinto Pickup truck. It was not part of the normal Ford production but was a custom vehicle according to the owner. Well Bill Irwin has a TT with the enclosed cab and Hemco conversion in Glade Valley NC.Looked factory to me and I looked it over good as far as the cab. But the Hemco stuff woulda been put in after market. It also has a 2 speed rear axle.IF the cab was a custom job it had to be done back years ago because all of the body work was scuffed and aged the same. No obvious "new" work done. That would be a good ton truck to check further on. Would you please verify what year was the Ton Truck and what style of front fenders and hood it has? If it is a 1926 or 27 with the 1926-27 passenger car front fenders, hood, splash aprons and long running boards that was assembled by Ford, that would be a great find. Do you live near Bill Irwin? Can you contact him and ask about the history of his truck. Can you obtain photos etc. And of course what are the other parts on the truck -- all 1926-27 or a mixture of many years etc. Hap I sent you a pm. I replied, Thank you and I will try to contact Bill Irwin in the next week. Also, does his 1927 Ton Truck have the 1927 passenger car front fenders and hood? It has been about 4 years since I saw it. I cant say for sure. But I saw him at a tractor show last summer and he said he still had it.